Lions and Zulus and Bears … Oh My! I grew up amidst Zulus and bears. This, in Coventry, in the 1970s. I was reminded of the fact watching Doctor Who and The Ice Warriors , which revealed that the black bear starring in that production was a Warwickshire bear on hire from Zoo-Rama, a firm based in Warwickshire. I don’t know if they were based at Coventry Zoo Park, which was just down the road from me. To get to it, we had to cross a small wooden plank over a river. It was practically exploring the Amazon, especially for a 10 year old Doctor Who fan. I was a young Bear Grylls. I used to Walk With Bears. Well, once my brother and I saw a bear in the fields opposite our house. It was being led out by the Keeper from Coventry Zoo and although we were told we could walk with the bear, we had to be wary of the Alsatian dog that accompanied it. Of course, these days it would be crazy to let kids walk with bears. Which is Health And Safety gone mad. I like to think this was the very same bear that appeared in The Ice Warriors. The zoo itself was awful. It was full of sad and bored animals, pacing around in cages too small for them and looking out forlornly from concrete ‘enclosures’, just waiting to die. The monkeys had the only luxury accomodation ,a model of the Rock Of Gibraltar. I now hate zoos, for all sorts of reasons, but the trauma of being bitten by a pelican as a child must be one. At some point, the owners had the bright idea of adding a ‘dolphinarium’ and so for a brief while we had dolphins in Costa Del Coventry, Dolphin Capital Of The Midlands. 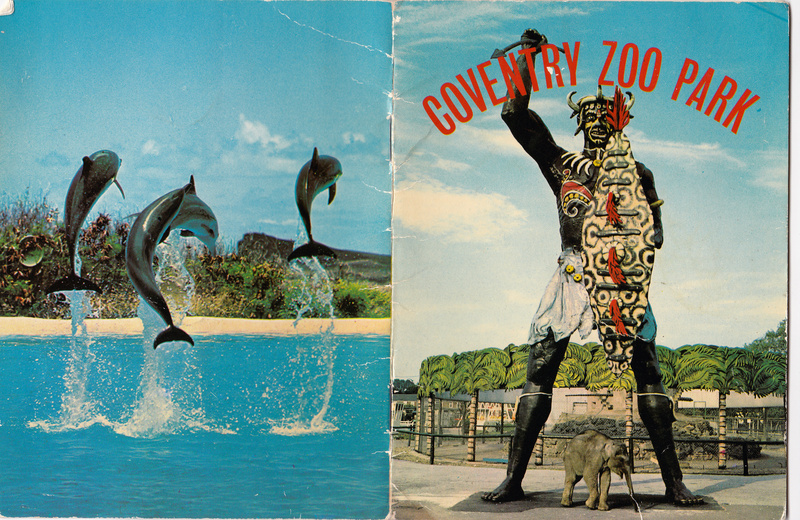 I sometimes think I’m imagining it all, but recently came across an article detailing the chequered history of The Rise And Fall of Coventry Zoo. It is, gentler Reader, not for the feint-hearted, being a gruesome tale of melted ice cream, tooth-ache ridden mauling hippos, an ostrich-hating kangaroo, bad-tempered porcupines and child eating naughty tigers being fended off by an umbrella. Director David Chipperfield, cousin to the circus family, once bemoaned the fact that “Just because your name is Chipperfield, people think you’re a millionaire. We just happen to be related to them, that’s all,” And this before the Chipperields started taking their clothes off. The Zoo was guarded by a 35 foot Zulu statue once rumoured to have been bought by one of my idols, comedian Larry Grayson, for Crossroads star Noele Gordon. In fact he ended up all broken down in an ex-boxer’s junkyard (the zulu, not Larry Grayson). The last anyone heard of him, his foot (the only part remaining) was being auctioned on E-Bay at the behest of tanned TV antiques expert David Dickinson. This entry was posted in Uncategorized and tagged bambi, bear, Bear Grylls, chippefields, circus, coventry evening telegraph, coventry zoo, coventry zoo park, crossroads, cv3, David Chipperfield, David Dickinson, deer, Doctor Who and The Ice Warriors, hippo, Ice warriors, larry grayson, lion, lions tigers and bears, noele gordon, pelican, Rock Of Gibraltar, Television, tiger, warwickshire, Whitley Common, whitley zoo, whitley zoo park, zoo, Zoo Rama, zulu, Zulu people. I remember the zoo, it was awful wasn’t it? We lived by the Common and when the circus used to come to town (they were allowed performing animals then) we used to go and feed the elephants cabbages and fruit and meat to the lions and tigers (by hand through the bars of their enclosures! Often daring beasts would escape and we’d have to stay indoors. I vividly remember falling asleep at night and hearing the lions and tigers roaring and the elephants calling out. Happy memories for me … but probably not the wild animals.